Nothing can prepare you for the leather-lined comfort and silent power of Tesla electric vehicles, and piloting one around the North Coast 500 makes for an unforgettable trip. Designed to eliminate ‘range anxiety’, this specially created holiday gives you the opportunity to experience two of motoring’s newest legends, along with some of the route’s most welcoming accommodation. 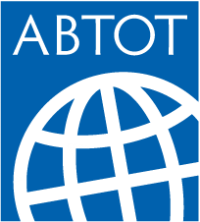 As featured in the Financial Times on January 6th 2018 (subscription required to access online article). Mar - Oct. Roads are that bit quieter earlier and later in the season. 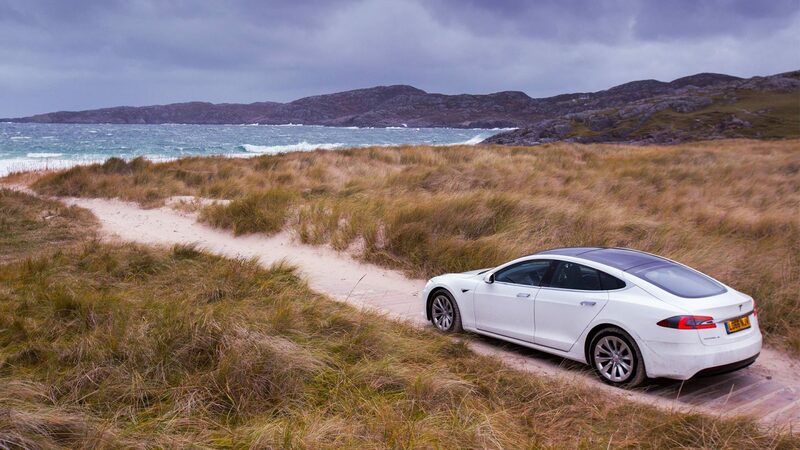 Your Tesla Model S will be delivered to a convenient location of your choosing you in Edinburgh or Glasgow) fully charged and ready to go. 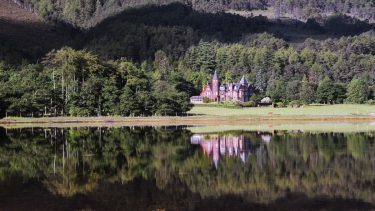 Start your trip by heading north from the city and you’ll soon be surrounded by Highland scenery, passing into Perthshire and through Cairngorms National Park. This part of the journey presents the perfect opportunity to get to know the Tesla, and enjoy the futuristic experience. 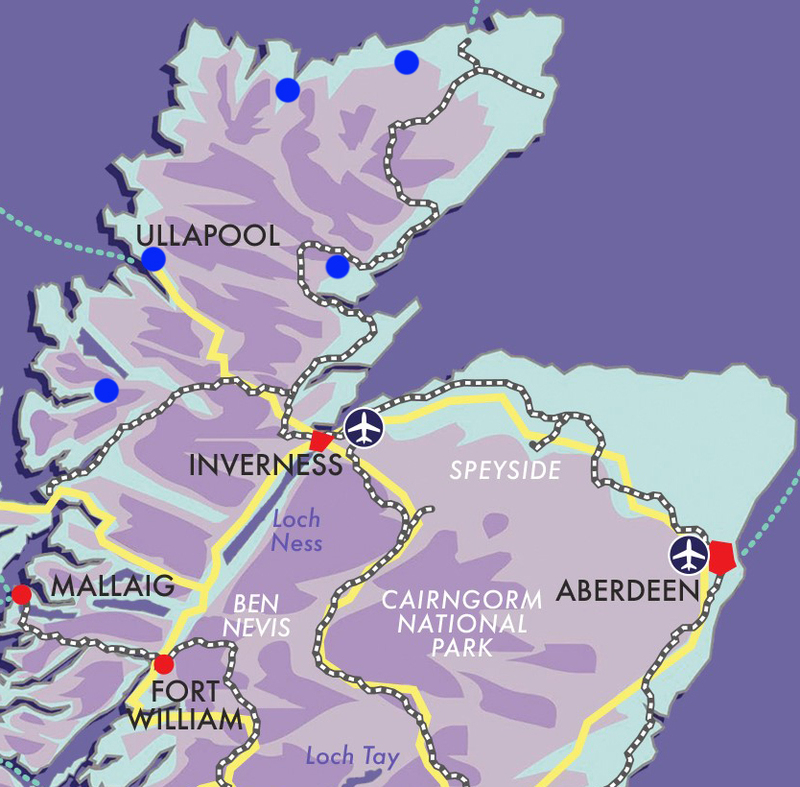 Once you reach Inverness, the Highland capital, pick up the North Coast touring route, in an anti-clockwise direction. Make your way around the Beauly Firth and join the A9 as it hugs the East coast, crossing the Cromarty and Dornoch Firths to your first base just outside the pretty Highland town of Dornoch. We’ll provide lots of ideas and recommendations for places to stop along the way, formed from our years of experience in seeking out Scotland’s hidden corners. 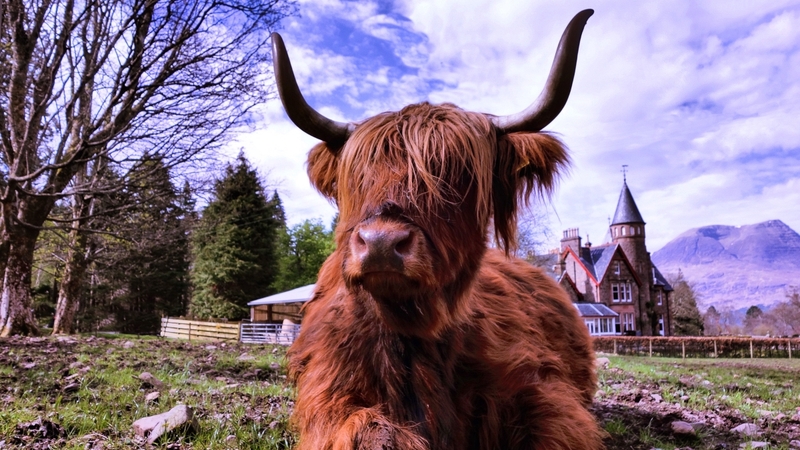 In a peaceful rural location just a mile from the centre of Dornoch, your first base is a recently created small hotel, formed from characterful and historic E-shaped barns on the Duke of Sutherland’s estate. Your hosts are lifelong hospitality professionals with a gift for making guests feel immediately welcome as you step through the front door in to the spacious guest lounge. High ceilings and double-height cathedral windows, with large sofas and inviting armchairs arranged around the wood-burning stove make this a relaxing spot to enjoy a glass of wine or tumbler of your favourite malt. Just eight well-appointed bedrooms mean there’s no danger of overcrowding, and the icing on the cake is the in-house bistro, where the award-winning chef serves a menu of imaginatively presented Scottish classics, majoring on the very finest local, seasonal produce. The hotel features electric vehicle charging points on its grounds. Take your time over a lavish Scottish breakfast this morning, before hitting the road and heading north. 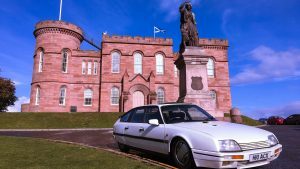 Following the A9 as it pitches and twists along the coast, perhaps stopping at breath-taking Dunrobin Castle, you’ll pass through evocatively named villages like Achrimsdale, Kintradwell and the atmospheric port of Helmsdale before joining the A99 to Wick, perhaps a good place to stop for lunch and to stretch the legs. 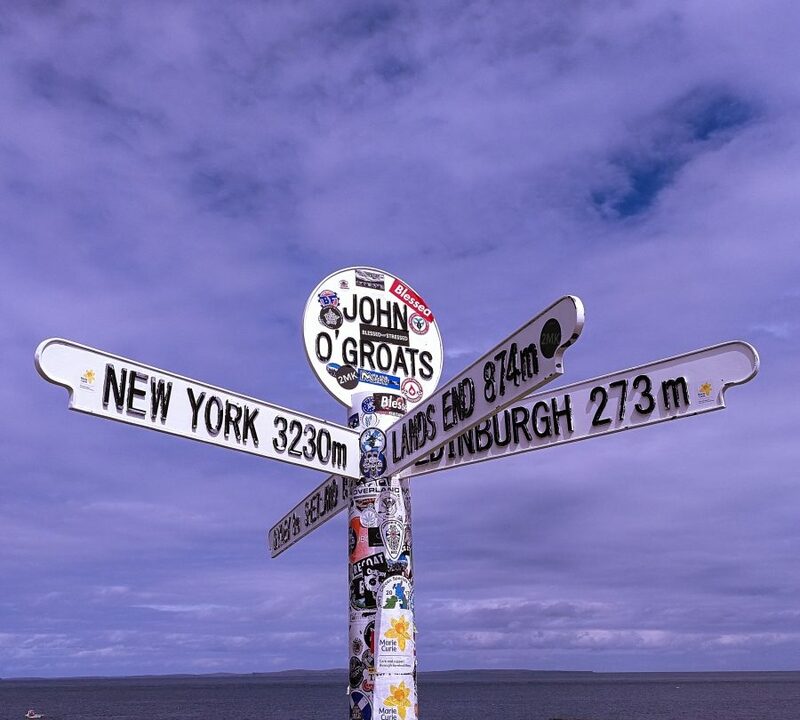 From Wick, it’s a short hop to John o’ Groats, where you’ll want to record your visit, and maybe take a detour to Dunnet Head, the UK mainland’s northernmost point, before making your way across the north coast to your next stop in Thurso. Tucked away down a quiet street, yet just a few minutes’ walk from the beach and the centre of town, your accommodation in Thurso is a locally owned guest house where visitors are made to feel at home the moment they arrive. Simply appointed large en-suite bedrooms are free of fuss, while ‘as you like it’ breakfast is served in the comfortable dining room. Your host is an enthusiastic ambassador for Thurso and Caithness, full of great advice on how to get the best from your time here. A Tesla charging point is provided in the house car park. The magical islands of Orkney are just 90 minutes away by ferry; should you fancy a night or two there we can easily arrange. Your day on the road today could be as swift as you like, or you could do as we love to do and take detours down some of the north coast’s mysterious side-roads as you go, through isolated hamlets, often terminating at hidden coves, deserted beaches and ancient harbours. 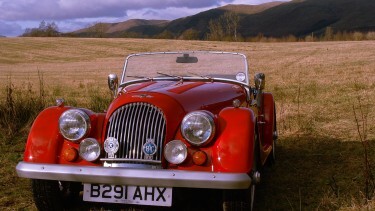 You’ll have 200+ miles of charge, giving you plenty of scope to explore this most evocative area of Scotland. Your family owned hotel is a cosy and long-established inn, with inviting bar and good restaurant serving a tempting menu of local and seasonal produce. Much refurbished over the past couple of years, the owners have made great strides in improving the public areas and guest accommodation, and the spacious bedrooms are an appealing blend of modern and traditional touches. An electric vehicle charging point is available a few short yards from the hotel. A longer day on the road today, and you’re in for an enormous treat as the route follows quite superb driving roads amidst some of the UK’s most dramatic mountain and coastal scenery. 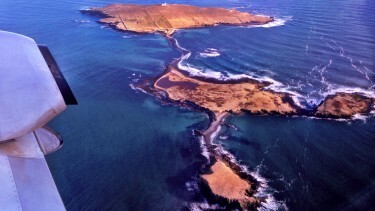 Again, we love to take ourselves off the main route, discovering concealed villages and havens, as well as the drama and awe-inspiring beauty of the northwest coast. 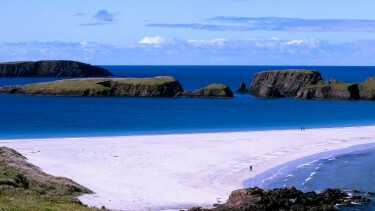 You won’t forget the sweeping curve of the Kyelsku Bridge, or the yawing route through Drumbeg to Achmelvich beach. before the descent to the classic Sutherland fishing village of Ullapool. Just a block back from beautiful Loch Broom, your accommodation in Ullapool is one of the most appealing places to stay in the northwest. Long-established by its family owners, the property is bunkhouse, café, gallery, music venue and bookshop all rolled in to a hugely appealing whole. En-suite rooms are spacious and elegantly furnished, and feature a selection of books on, for example, politics, art, theatre and history for guests’ enjoyment, available to buy at the end of your stay from the surprising in-house bookshop. Dining here is hearty and wholesome, either in the rustic café or more formal restaurant, and the village features one or two good alternatives. There are electric car charging points within a short walk, and staff are always eager to assist. 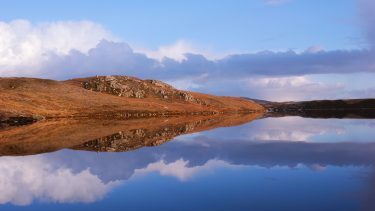 Depart Ullapool this morning and take the meandering coastal route to Torridon. 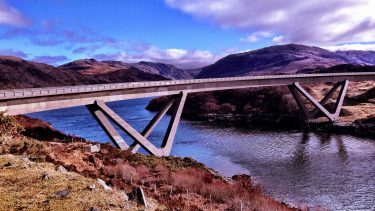 South of Ullapool you’ll find the vertigo-inducing Corrieshalloch Gorge, before the road twists westward past Little Loch Broom and on to Aultbea and fascinating Poolewe. Overlooking Loch Ewe, here is the point from which the Russian Arctic Convoy departed during World War Two. Visits to the eerie lookout positions high above the loch, and the terrific museum commemorating the convoy are a must. Later, the route descends to Gairloch and the shores of Loch Maree – perhaps the prettiest of all lochs – shortly arriving at the shores of Loch Torridon for two nights. 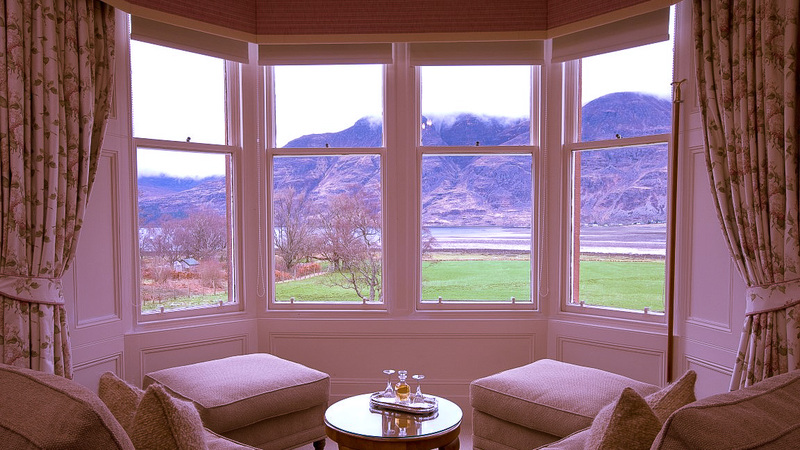 Set in extensive mature grounds on the edge of a majestic sea loch, your hotel in Torridon boasts one of the finest and most peaceful locations in Scotland. Attentive staff see that your every need is met, and you’re sure to love the hugely comfortable bedrooms, beautifully presented public areas and acclaimed restaurant. Adjacent to the hotel, the Inn offers a more laid-back atmosphere for dinner and drinks. The hotel features two electric vehicle charging points. 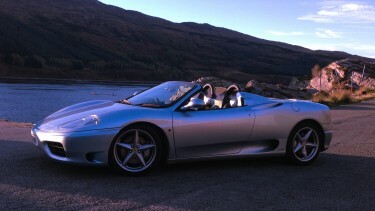 Perhaps a day to leave the car and take advantage of the world-class activities available in this fabulous location. 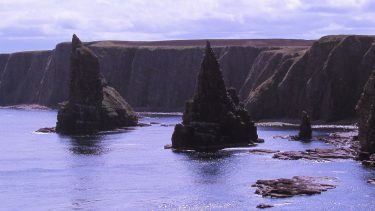 The hotel features award-winning guides offering sea kayaking, guided walking, gorge scrambling, canoeing and much more. Pre-booking is advised and we are happy to facilitate on your behalf. 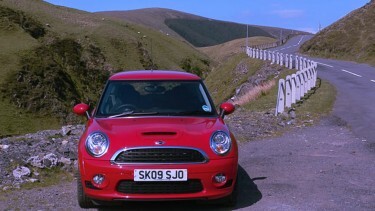 On the other hand, who could blame you for opting to take the car out on some of the country’s most fun driving routes? Nearby you’ll find one or two awesome mountain passes, as well as often-deserted roads though more of Scotland’s most arresting scenery. This morning takes you around the legendary Applecross peninsula, traversing the famous Bealach Na Ba pass, one of the UK’s most challenging and thrilling roads, with steep gradients and superb hairpin bends. Applecross itself is a fine place to stop, its inn serving good food amidst wonderful views across the water to the Isle of Raasay and Skye beyond. Once off the pass, the route carries you alongside Loch Carron and onwards on the sweeping route through Glengarry to Fort William in the shadow of Ben Nevis. South of Fort William, you’ll enter the majestic landscape of Glencoe, where you’ll find your hotel for your final night. A 17th-century hunting lodge provides the basis for this newly created hotel, in what must be Scotland’s most awe-inspiring location. The once-crumbling lodge has been transformed in to a cosy bar, where guest are invited to enjoy a dram or two around the fizzing log fire before dinner. And this is where things take something of a turn: a brand-new glass extension has been skilfully added, containing a bright and airy dining area, where guests dine on Scottish classics while drinking in the breath-taking view down the valley. 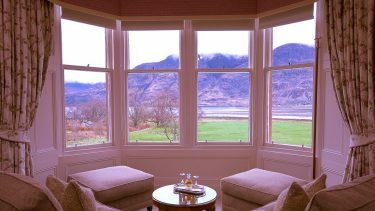 Accommodation sits above, each of the comfortable and simply appointed en-suite rooms featuring that same dramatic view. After breakfast, it’s a good idea to take your time to soak up the unique atmosphere in Glencoe, perhaps during a stroll around the hotel grounds. 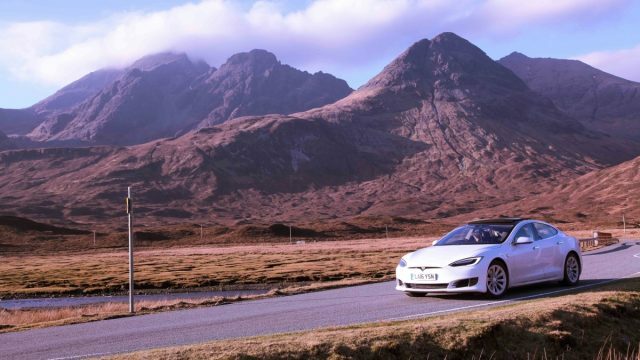 Once you take the wheel, you’ll descend through fabulously bleak Rannoch Moor and make your way around the North-eastern edge of Loch Lomond and the Trossachs National Park, eventually finding your way back to Edinburgh to drop off your Tesla and continue on your onward journey home. 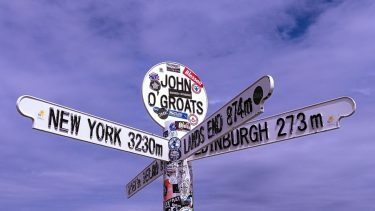 Start from Edinburgh or Glasgow, touring north to just beyond Inverness, then follow the North Coast 500 route to Thurso, Tongue, Ullapool and Torridon, then spend a final night in Glencoe, before returning to Glasgow or Edinburgh. £1975 per person in March & November, £2100 April & October, £2175 per person for May to September. 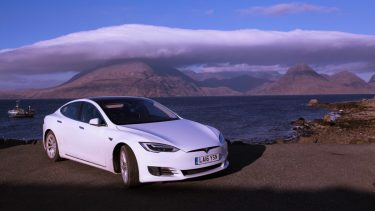 Price is based on two adults sharing a double or twin en-suite room for seven nights on a bed and breakfast basis in our hand-picked selection of hotels and guest houses, and eight days’ rental of a Tesla Model S, starting and finishing in either Edinburgh or Glasgow. Please note that the insurance company impose a maximum age for the hire of the Tesla of 75 years of age. 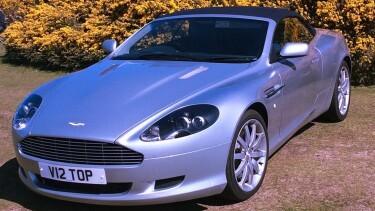 We can offer alternative, regular cars for the same itinerary if relevant. Before your departure, you will receive personalised holiday information including full directions, recommended routes and charging points, plus suggestions on places to visit depending on your interests and our local knowledge to help you get the most from your holiday. This holiday can be arranged from March to November.